The Channeling Demystified Class Manual is a self-study guide for the “Channeling Demystified” class. 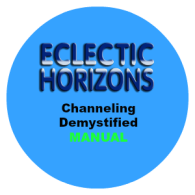 This manual steps the learner through defining channeling, the mechanics of automatic writing, the mechanics of trance channeling, trance channeling troubleshooting, and Kent’s experience. This is a .pdf of the manual only. The entire Channeling Demystified Bundle can be purchased here.